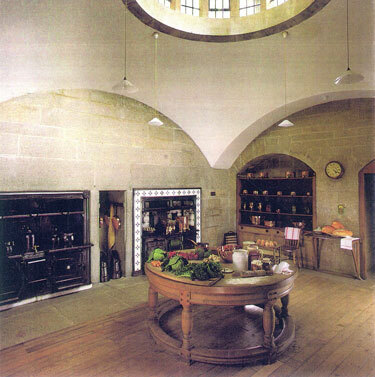 One of Lutyens best known interiors, the kitchen at Castle Drogo in Devon is a masterpiece in spatial design. 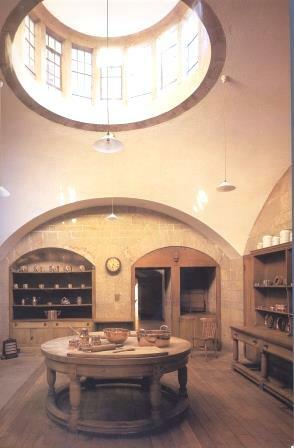 Lutyens made play of the circle and part circle in many of his designs (he was not alone in this, Voysey did the same) but this kitchen incorporates all these elements in a unified whole. The round table is one of his best known pieces. In a real tour de force of imagination Lutyens echoes the stunning oriel window above with the round table below. The arched arcades add to the effect. Even the turned legs of the table and dresser add to the effect. We could reproduce this table for you, either to the original size or a size of your choice. 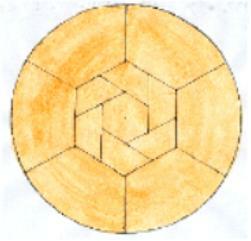 The original table top was made from several pieces of thick oak joined in a decorative pattern ( shown here ). However, this is technically difficult to do well and probably not that advisable from a practical point of view, as wood shrinks across the grain these joins will always open up no matter how dry the wood is). It makes better sense from a furniture design point of view to have a ll the boards and grain in one direction. Your choice. It is an expensive piece to make, very labour intensive. 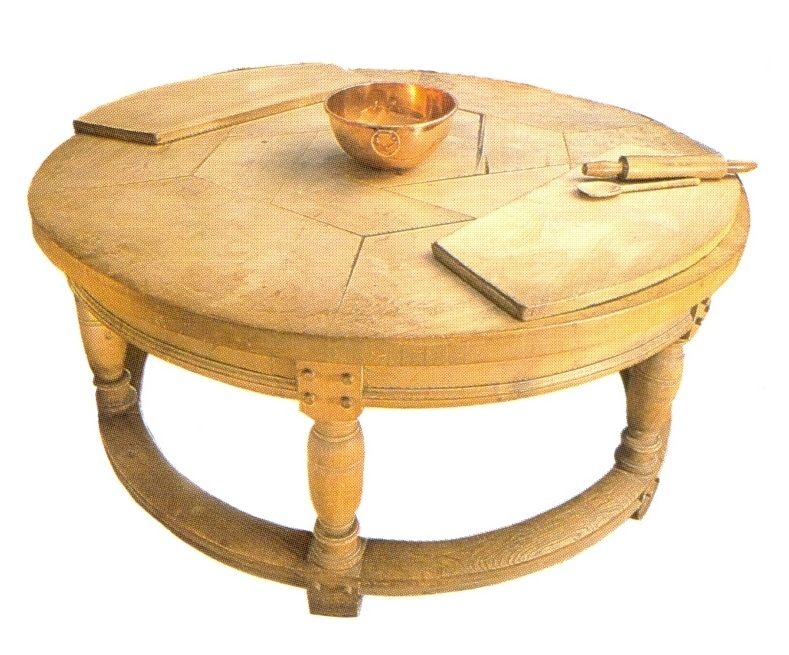 The table was designed as a working surface for servants, who would stand around it preparing, and could rest a foot on a stretcher ( for a change of position ). The table design could be adapted for use as a dining table, with some modifications. The round stretcher rails at the bottom make it an impractical table for dining chairs, as the chairs can not pull up properly under the table. The only way to overcome this would be to have either an overhang on the top or have the stretchers go through the middle ( rather than around the outside ). We like to make these considerations clear to anyone interested in commissioning such a piece. 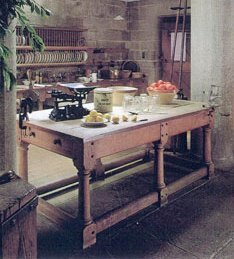 There is also a rectangular version of this table at Castle Drogo, shown above, that we could also produce. 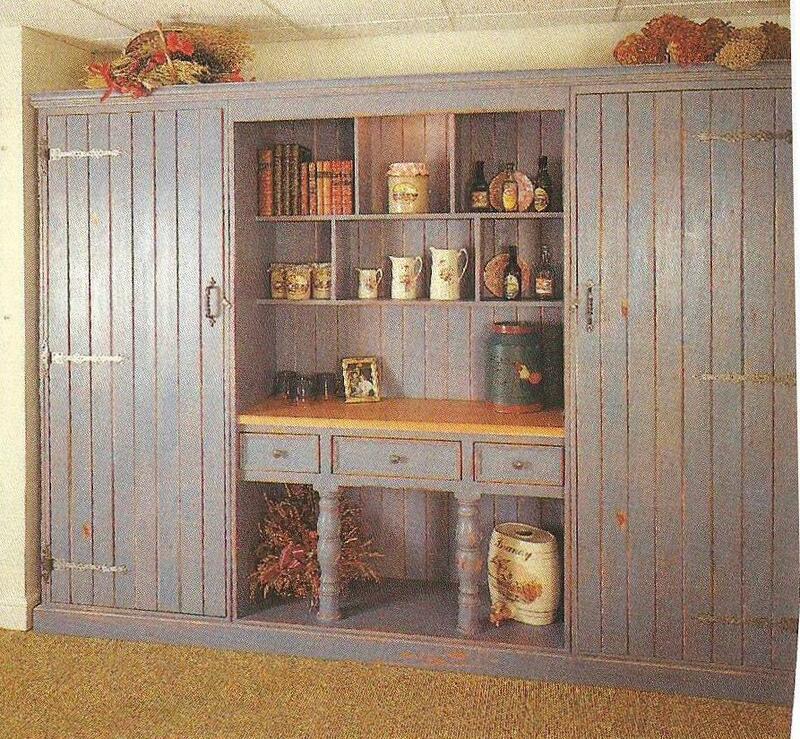 All the furniture in the kitchen is stylistically related to each other, inluding the dresser. These tables were originally made in beech wood, which we can do or oak, which would look more attractive. Lutyens probably took the view that Oak, with it's more open grain, was harder to keep clean in a busy kitchen. 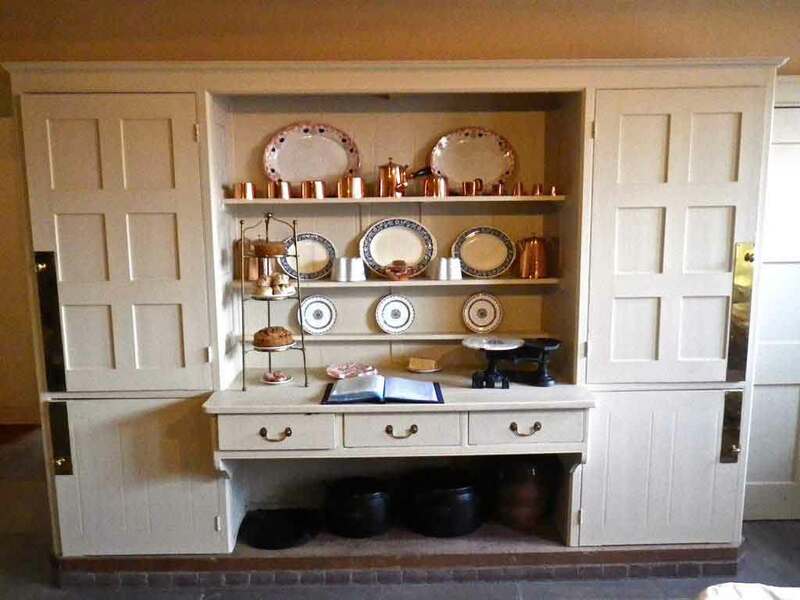 Above is the freestanding dresser Lutyens designed for Castle Drogo kitchen. It is based on the large kitchen dressers found in C18th country houses. Again the turned legs and thick stretcher rails echo those on the table. We could produce this dresser basically to whatever size, format, wood or painted finish you require. 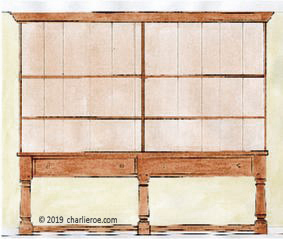 We did a design of this dresser for the Little Thakeham kitchen. Lutyens rebuilt and remodelled Lindisfarne Castle for the then owner of Country Life magazine. The kitchen is domestic in scale, rather than the huge scale of Drogo. 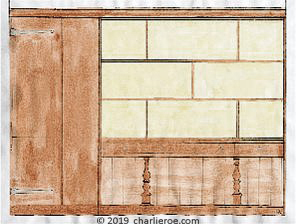 This was a simpler elegant dresser, see photo top right, with the inspiration coming from C18th country house kitchens. 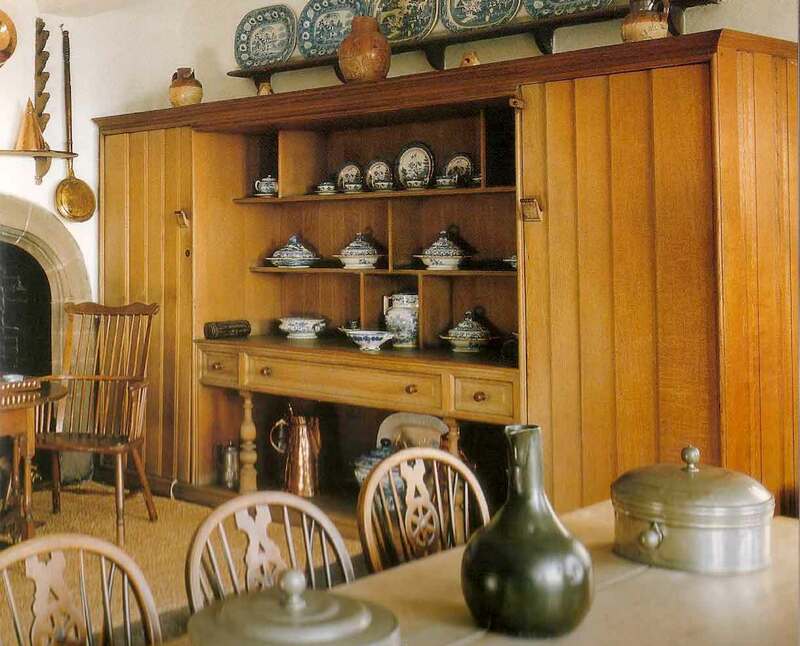 But the real model for it was Phillip Webb's painted dresser at Standen House, shown at the bottom. 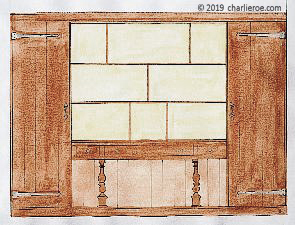 The dresser section sits between cupboards at either end, as shown on the design h/w. The design with the larger cupboard, mjiddle right, was intended to incorporate an American style fridge freezer for a customer. The asymetric design works well, and is a theme running through Arts & Crafts design. Made in Oak, or whatever wood you prefer, or an (antiqued) painted finish, as shown middle left. This can be adapted to your own size and use requirements.